Pedal past Gilligan's Island, Hawaii Five-0 and Magnum PI film locations just to name a few. Ride by parks, malls and a gentrified Kaka'ako park with futuristic neighborhood murals. Visit the Aloha Tower waterfront and take the elevator up the historic clock tower. You'll make your way to Chinatown and explore its cultural history. 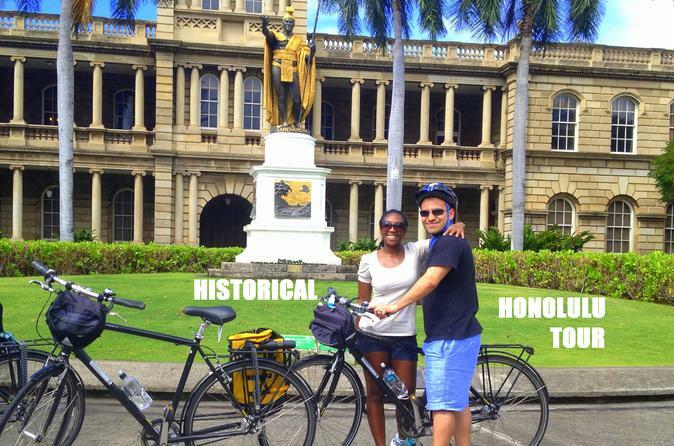 Cycle through the State Capital, Royal Iolani Palace, King Kamehameha Statue, Kawaiha’o Church, Mission Houses, and experience the place of Elvis's last concert. Explore cool new bike paths, canoe clubs and much more on this 3 to 4-hour bike tour. Meet at the Kuhio Beach Banyan Tree, Waikiki Beach 8:15am. After getting you fit and providing you with your demo bike, you'll begin gliding along Waikiki beach and past the Honolulu Zoo. From there, cruise down Ala Wai Blvd and learn of the Ala Wai Canal’s rich history. Explore the promenade and Honolulu Convention Center. Visit local historical beaches, malls and shopping centers. Roll along Magic Island and the Honolulu waterfront which takes you to Point Panic and Kaka’ako Park. Traverse Kaka’ako's redevelopment with its abundance of artistic murals. Take the elevator up to the top of Aloha Tower where you'll enjoy four classic views. As you cruise through the multi-cultural Chinatown, you’ll experience Island culture first hand. Taste Hawaii’s exotic fruits while navigating downtown. Roll onto the historic State Capitol, Royal Iolani Palace, King Kamehameha Statue, Kawaiaha’o church, Mission House Museum, and the site of Elvis’ last concert. Taking this tour, allows you to see unique parks, local Hawaiian canoe clubs, golf courses, and you'll learn where the secret eats and treats of Hawaii are located. Photo shoots are offered at every location and you'll learn about the history of each location as you go. Receive informative and interesting narration as you enjoy your day to the fullest on mostly flat terrain.